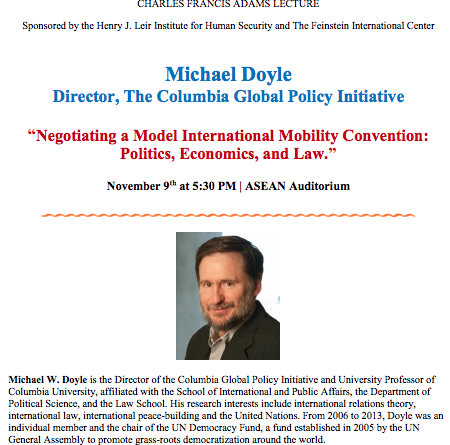 Michael W. Doyle is the Director of the Columbia Global Policy Initiative and University Professor of Columbia University, affiliated with the School of International and Public Affairs, the Department of Political Science, and the Law School. His research interests include international relations theory, international law, international peace-building and the United Nations. From 2006 to 2013, Doyle was an individual member and the chair of the UN Democracy Fund, a fund established in 2005 by the UN General Assembly to promote grass-roots democratization around the world. Doyle previously served as assistant secretary-general and special adviser for policy planning to United Nations Secretary-General Kofi Annan. In the 1990s, he was a member of a policy advisory committee for the UN High Commissioner for Refugees, Mdm Sadako Ogata. In 2003, he chaired a group that produced a report on migration for SG Kofi Annan.